The construction of the chicken coop relates to the chicken breeding work behind. The scientific and reasonable chicken coop can play the important role of improving breeding work efficiently and conveniently. Therefore, when building the chicken coop, we should consider the types of chicken that we breed, and then take into account the chicken house ventilation of poultry climate control system, poultry manural removal system, poultry feeding system and poultry drinking system in Livi Machinery. There are seval suggestions on thr types of chicken coop contruction due to chicken farm system of chicken coop as follows. There are windows in the henhouse, windows can be used for natural light and natural ventilation to save the production cost. Generally, no mechanical ventilation is used, and the use of brick-wood structure is more. 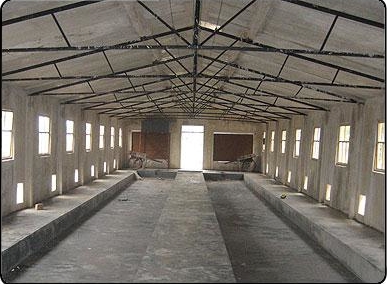 The building form is basically the same as the bungalow of common civil buildings. To the windows and roof ventilation cap, the universe before and after the symmetry. Consider the cold insulation, north of the chicken coop north window is generally smaller than the South. This artisanal building T Art is simple, medium cost, environmental control efficiency in general, the implementation of people Ah control light, it is difficult to make the light time shorter. Complete disinfection more difficult, suitable for small-scale professional use. Only with the roof, around (or front and rear side walls) is open, the installation of roller blinds, winter put down (or put on) roller blinds to semi-enclosed shelter from the wind, the other season, Housing temperature, weatherproof. This chicken coop construction process is simple, low cost, easy to clean and disinfect, you can control the environment to a certain extent (in the case of cold to strengthen the confinement). The implementation of manual control of light, it is difficult to control the light time. Open chicken suitable climate more temperate areas and more hot areas. 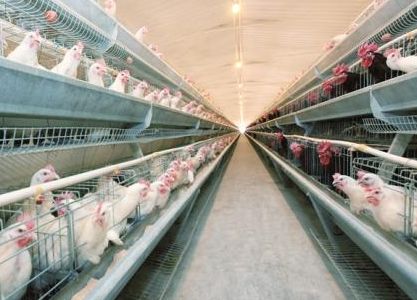 This kind of hen house can be manually controlled chicken coop environment, which will help create the best environment for chicken growth and production. Can be high-density feeding, the use of energy consumption, water, electricity, equipment, dependence, once the power shortage, the consequences could be disastrous. This chicken is suitable for all climatic conditions. From the perspective of sustainable development that is conducive to the production of laying hens, fully enclosed house is the focus of promotion in the future. This house, although more expensive to operate and produce than an open house, has a high level of production. Egg quality is high, raising the economic benefits than the open house, worth promoting. Those three types of chicken coop construction have their own advantages, such as ordinary chicken coop is suitable for breeding hens, and open chicken coop is suitable for breeding chicken, enclosed chicken coop is suitable for battery cage chicken farming, so you can choose a chicken coop constructions based on your own breeding category.